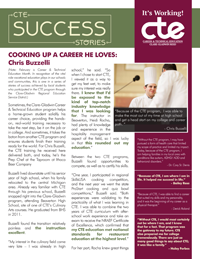 COOKING UP A CAREER HE LOVES: Chris Buzzelli — CTE: It's Working! Sometimes, the Clare-Gladwin Career & Technical Education program helps a home-grown student solidify his career choice, providing the hands-on, real-world training necessary to take the next step, be it on the job or in college. And sometimes, it takes the baton from another CTE program and ensures students finish their training ready for the world. For Chris Buzzelli, the CTE training he received here delivered both, and today, he’s the Prep Chef at the Taproom at Ithaca Beer Company in Ithaca, NY. Buzzelli lived downstate until his senior year of high school, when his family relocated to the central Michigan area. Already very familiar with CTE through his previous school, Buzzelli snapped right into the Clare-Gladwin program, attending Beaverton High School, site of one of CTE’s Culinary Arts courses. He graduated from BHS in 2011. Buzzelli found the transition relatively painless and the instruction excellent. Between the two CTE programs, Buzzelli found opportunities to compete, as well as to certify his skills. For her part, Rocha knew great things were in store for Buzzelli as he passed through her class. Aside from the classroom instruction and hands-on experience in real-world settings, CTE helped Buzzelli concentrate on what life after high school had to offer. CTE provides a valuable focal point for students, Buzzelli said, a place to start figuring out the rest of their lives. Buzzelli is quick to credit the role CTE played in helping him achieve his career dreams to this point. That post-high school life included graduation from the Culinary Institute of America, where Buzzelli set upon another profound path in his life – marriage. “I actually ended up meeting my now-fiancé when I moved to New York to attend college,” he said. “We both graduated from the Culinary Institute of America and are getting married early this autumn. We currently both work full time and are in the beginning stages of starting our own catering company. We have done two weddings in the past, and have three more this summer. "I currently am the Prep Chef at the Taproom at Ithaca Beer Company. I manage the levels of prepared food throughout the restaurant and I am responsible for cooking, cutting and creating anything needed for the various stations in the kitchen. I report to the Sous Chef and Executive Chef directly and work closely with them to develop new recipes and menu items. The thing I enjoy most about the work is the immediacy and physicality of it. It requires you to be psychologically present in the moment and in tune with all your senses and surroundings at all times."